Ancestry seem to be giving free access to military records again. In late October I was getting access to MICs without charge and I assumed this was the same as last year when access was given during November. Come November it stopped and when I checked with ancestry they told me they had no plans for free access this year. I did update my message on SWMP but forgot to do the same here. I have a subscription so can do the odd lookup for people. 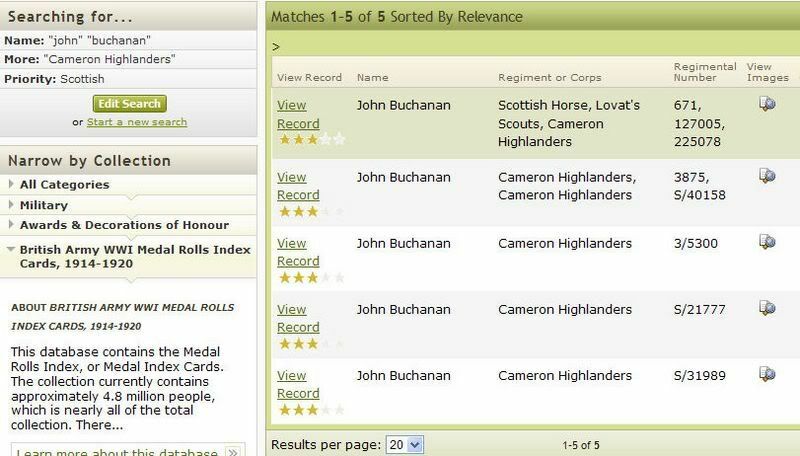 You could check for my gt grandfather Pte John Headrick Buchanan who served the Cameronians(Scottish Rifles). Lived in the Gorbals area of Glasgow. his parents were Alexander and Elizabeth Nee Drummond. Married Annie Monaghan (pos after leaving army) I got his picture but no details of his army number etc. Ooh, that's difficult trying to identify a soldier who survived with a fairly common name (only 1st and last are searcheable) and when you only know the Regiment, not number. There were 5 John Buchanans listed with medal index cards. It is always possible that for some reason he was never entitled to any medal but that seems unlikely. I assume your ancestor survived the war which rules out number 3 as he was killed in action. Number 4 is the only one whose service record seems to have survived - his mother was named Agnes and came from Dunfermline. Your best bet is to see if his medals survive in the family somewhere - they will have his number inscribed around the edge.